Even though none of the currently known objects are a threat to earth, couldn’t that change if the orbits of any of these 10,000 objects is altered by a close encounter with a planet or a moon? Yes and no. It’s true that gravitational perturbations by other solar system objects can have significant effects on the orbits of these asteroids. But the people evaluating the threat levels include these effects in their calculations as best they can. 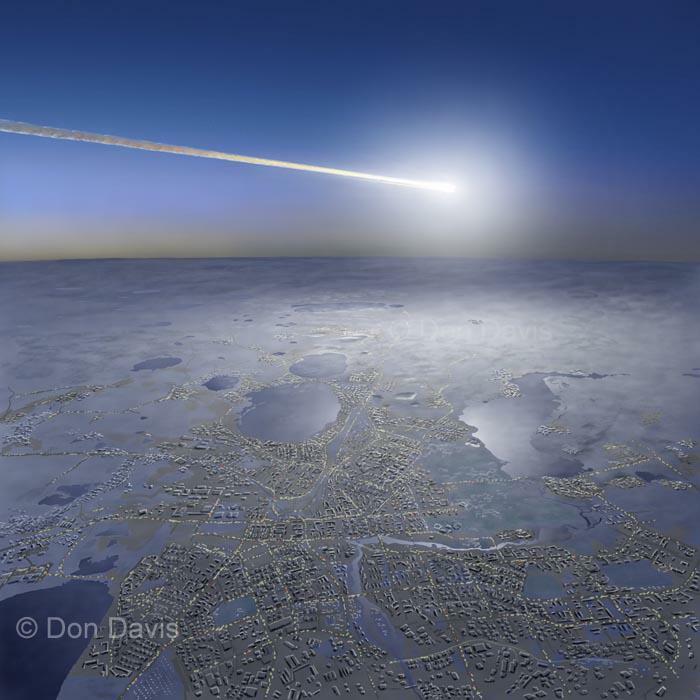 The Chelyabinsk incident created a momentary world wide sensation that hopefully does not fade any time soon. The recent announcement that Russia is interested in partnering with the United States and others to create defensive measures for future threats is very encouraging. The weakest link is the realization that similar objects may not be easily observed due to those orbits which are sunward obscured. Remnants from sun grazing cometary or asteroidal bodies come to mind here. Not only would those objects be difficult to pick out in the solar glare but also may only be detected when too close for us to mount any kind of defensive measures. Launching observation stations located in solar Lagrangian points, or on the lunar far side for 24/7 views would not come cheap, but would prove their value if they saved us from annihilation? Shall we send this line of reasoning to congress so they can hem and haw about the expense? thing of equal value. Thanks again for the idea buddy! Great find, I’m a big fan of D. Davis’ art. Thanks for sharing.